A triple threat in baseball is a player who could run, hit and field. In the special needs community, a triple threat is a player who can envision, advocate and activate. This morning I led some guests on a tour of the Orange Grove Center where I have been lucky enough to call home for the last 20 years. One of the highlights of the tour is our “Snoezelen Room,” or our Multi-Sensory Environment (MSE) center which was gifted to us by Flaghouse to explore treatments for individuals with multi-sensory processing disorders. The concept of MSE is that we can provide, regulate, modulate and expose individuals to various levels, combinations, intensities of sensory stimulation and, hopefully, identify rewarding and individual sensory diets. The Room is a gem and is highly regarded by our therapists, students, teachers, researchers and parents. The MSE center provides opportunities for sensory exploration, but it’s bricks and mortar, and is obviously a destination. For some reason I started to think of growing up in Brooklyn in the Fifties and while we didn’t have a Snoezelen Room we did have Sol’s Candy Store. There we were exposed to a flurry of sensory excursions. The sound of the seltzer hitting the milk and chocolate syrup as Sol created an “eggcream.” The taste of pretzel rods after swirling them in the egg-cream. The sight of a rack of newly delivered comic books featuring our favorite super heroes. Sol’s Candy Store (or formally known as The Luncheonette) could certainly rival a Snoezelen Room for sensory bombardment (and the perils of over stimulation). But like the MSE center, Sol’s store was brick and mortar and you couldn’t transport it. There was, however, one piece of the “multi sensory environment” that could be taken away and, for some reason this morning, while taking a tour, I thought of it. The last, referring to a duplicate card that you already had and you were mentally earmarking it for trade. The smell of the gum, coupled with the smell of the printing chemicals used to create the cards, lingered for hours. The cards also provided us with the ability to hone our social skills in “flipping” the cards (match your opponents and you get his cards), pitching the cards (nearest to a wall wins) or seeing how many you could stack and surround with a rubber band that would fit in your dungarees (precursor of jeans). 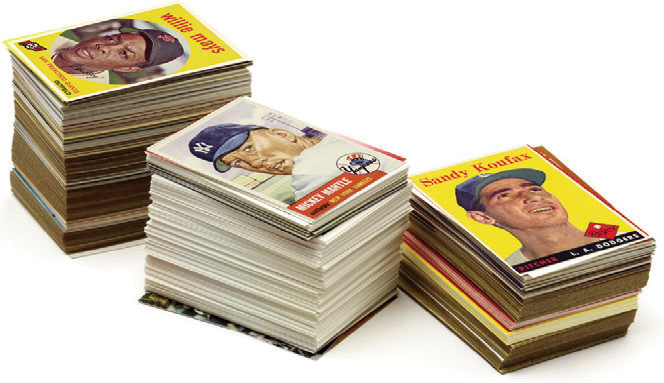 While baseball cards were produced in the 19th century, the “modern day card” was designed and marketed by Sy Berger in the 1950’s. Richard Goldstein of the New York Times explained the setting for the growth of the cards. “The decade after World War II was the perfect time to revitalize them. The Yankees, the Brooklyn Dodgers and the New York Giants dominated baseball, providing a fertile marketing climate aimed at youngsters in the New York metropolitan area who had been born in the immediate post war years. And throughout the United State, the arrival of television made it possible for youngsters to watch their baseball heroes in action.” Sy Berger died last month at the age of 91 but left us the legacy of the portable “multi-sensory environment,” called the Topps Baseball card pack. It’s not just baseball heroes that deserve to be captured and immortalized on card-board cards. While every exceptional parent is a hero, although a quiet and unannounced one, the special needs community does have its fair share, both living and deceased, whose own cards deserve to be printed, collected, traded, swapped and, most significantly, appreciated and emulated. I would gladly trade you a mint Duke Snyder for a faded Katie Beckett; or a Mickey Mantle for a edge-worn Eunice Shriver and a preserved Yogi Berra for a creased Burton Blatt… all triple threat heroes in the disability rights movement. A triple threat in baseball is a player who could run, hit and field. In the special needs community, a triple threat is a player who can envision, advocate and activate.